Did the Federal government respond poorly to Katrina? I think so, on some levels. I don’t blame the Feds for the fact that people were stuck in New Orleans; that was the city’s fault. And I don’t blame the Feds for failing to act in the first day or two; that’s the State’s role. But when those folks were in that stadium for that long, ya gotta get ’em out. Somehow. One day, a scorpion looked around at the mountain where he lived and decided that he wanted a change. So he set out on a journey through the forests and hills. He climbed over rocks and under vines and kept going until he reached a river. The river was wide and swift, and the scorpion stopped to reconsider the situation. He couldn’t see any way across. So he ran upriver and then checked downriver, all the while thinking that he might have to turn back. Suddenly, he saw a frog sitting in the rushes by the bank of the stream on the other side of the river. He decided to ask the frog for help getting across the stream. I’m the first second to admit, my wife is the first, that I haven’t actually RUN anything either. I don’t own my own business, I don’t have P&L responsibility in my current job. And while I can interview and choose who I hire, the decision TO actually hire ain’t mine. Mark Perry nudged me the other day. We hear so much how bad it is in America. That the middle class is “under attack” and only the Government can save them. Further, the health care debate has pointed out that America spends more on health care than any other nation in the world. What does this tell us? It tells us that being poor in America means that you have a bigger house than the average European. It tells us that whatever we have been doing, we should do more of it. And that any modeling on Europe would be a mistake. They are girding their loins. They are building the siege engines. Iron has been forged into swords. Boys are becoming men. Men are leaving their families. WAR is upon us. 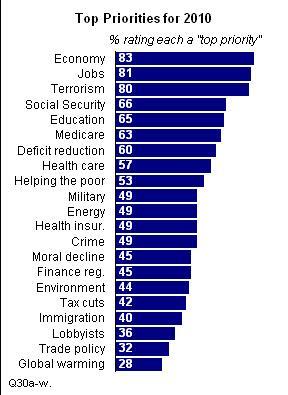 Pew Research center has found that the concept of global warming doesn’t stir the public’s desires. Wise leaders would do well to follow those they lead. Leftists, all ya’ll…come over here. We have, in real time and in a real country, a case where a leader is trying to implement Socialism on his country. It started out all right. The people were very happy to hear that they would all get to go to the circus and have ice cream before bed. Longer summer vacations and shorter schools years too. The people were happy, the boss was givin’ away the joint and all the while claiming the “rich” would just pay for it. Balance it out, after all. It’s only fair ya know. The state oil company, PDVSA, produced 3.2 million barrels per day in 1998, the year before Mr Chavez won the presidency. After a decade of rising corruption and inefficiency, daily output has now fallen to 2.4 million barrels, according to OPEC figures. About half of this oil is now delivered at a discount to Mr Chavez’s friends around Latin America. The 18 nations in his “Petrocaribe” club, founded in 2005, pay Venezuela only 30 per cent of the market price within 90 days, with rest in instalments spread over 25 years. Not only has the company failed to keep up with technology and INCREASE its production, he has reduced it. And on top of that, he is robbing his country of the money that he COULD be making by asinine payment terms. But hey, the people are happy with this Socialism, right? Tens of thousands of Venezuelans opposed to President Hugo Chavez took to the streets Saturday, blaming him for rolling blackouts, water rationing, widespread crime and other problems they say are making daily life increasingly difficult. I tuned into a number of Liberal outlets last night and this morning. Of course, the subject of the conversation is the victory in Massachusetts. Now, this is politics, so to listen to them spin this is expected, they HAVE to do that. Literally, it’s their job. And in this, the Republicans would be spinning in the same way had Brown lost. But, what I heard the most last night and so far this morning is that the reason Massachusetts voted against this National Health Care is that they already have their own. And because they already have their own, why would they wanna pony up, tax themselves to provide a plan they already have? So, according to the Left, this isn’t a referendum on Health Care, it’s a case of not wanting to pay for something they already have. This tactic is clever. It allows the Left to sidestep the referendum AND claim that Massachusetts really REALLY likes government provided health insurance. I think the Left is wrong. I think Massachusetts voted against Health care because they don’t like their version of it. appear to have crowded out private health insurance and made Massachusetts a less attractive place to relocate, particularly for young people. People view taxes as damage and route around it.